Plants perennial, mostly loosely cespitose, to 100 cm, bases swollen; rhizomes short, knotty, or scaly, slender, contorted. Culms sometimes solitary, narrowly linear, distally angular, glabrous. Leaves ascending, from 1/3 as long to equally as long as culms, glabrous to pubescent; sheaths apically ciliate; ligule essentially absent or (in rhizomatous individuals) present, complete or incomplete; blades narrowly linear, 1-2 mm wide, mostly strongly involute, scabrid-ciliate. Inflorescences: anthelae simple or compound, compact or diffuse, mostly broad, ascending-branching; scapes slender, wandlike, 1 mm thick; lower leafy involucral bracts exceeded by or exceeding panicle. Spikelets variously red-brown, broadly ovoid to lance-cylindric, 5-10 mm; fertile scales broadly ovate, obtuse or obtuse-angled, 2.5-3.5 mm, abaxially glabrous or variously puberulent, midrib excurrent as mucro. Flowers: stamens 3; styles 2-fid, flat, fimbriate. Achenes yellowish to dark brown, lenticular-obovoid, 1 mm, with 11-20 vertical lines of horizontally rectangular or isodiametric, distinct or indistinct pits. 2n = 20. Perennial herb with rhizomes, loosely tufted or culms sometimes solitary to 1 m tall Leaves: basal, ascending, shorter than or as long as culms, 1 - 2 mm wide, narrowly linear, parallel-veined, marginally rolled inward above, sometimes hairy, with a sheathing base that encloses the stem. Sheaths shorter than the blade, broadly margined, and opening at the top. Inflorescence: a terminal, simple or compound, dense or widely spreading anthela of spikelets subtended by leaf-like bracts (an anthela is a type of inflorescence which bears lateral branches that are longer than the main axis). Bracts shorter than or surpassing the inflorescence. Flowers: minute, subtended by a floral scale, lacking sepals and petals. Stamens three, exserted. Anthers 2 - 2.5 mm long. Pistil one. Style enlarged basally, fringed, two-cleft. Fruit: a one-seeded achene, yellowish to brown, to 1 mm long, swollen, reverse egg-shaped and biconvex, minutely cell-like and wrinkled in vertical rows. Seed with a thin, non-adherent wall. Culm: sometimes solitary, to 1 m long, slender, circular or broadly oval in cross-section, angled above, solid, variably hairy, growing above the leaves. Spikelets: reddish brown, 0.5 - 1 cm long, widely egg-shaped to cylindrically lance-shaped. Floral scales spirally arranged and overlapping, 2.5 - 3.5 mm long, widely egg-shaped or reverse egg-shaped, sometimes minutely hairy, with a midrib that extends past the apex into a tiny point. Lower spikelet scales non-flowering, larger than the fertile flower scales, and often bladed. Similar species: The similar Fimbristylis autumnalis differs by having three-cleft styles and three-angled achenes. 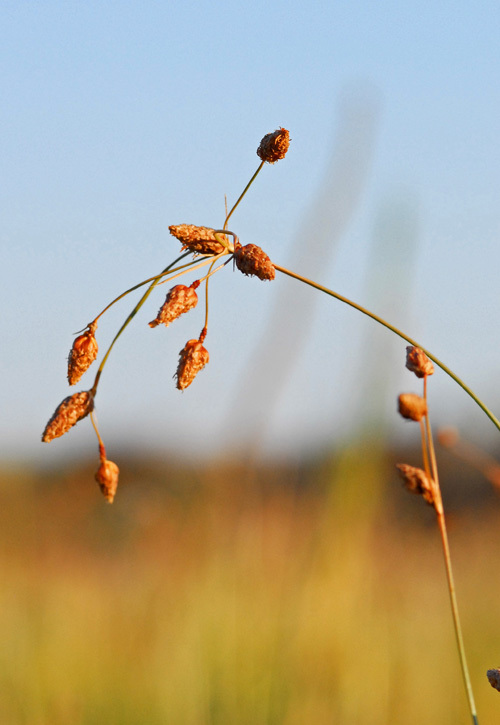 Habitat and ecology: Most common in flat sandy grasslands near Lake Michigan. It also has been found in a sandy wet prairie and in other sandy areas away from the lake. Etymology: Fimbristylis comes from fimbria, meaning "a fringe," and stylus, meaning style, referring to the hairy-fringed style in the genuine species. Puberula means tiny-haired.